This is a Manchester United blog for American Fans. It will cover transfers, club news, previews of games, results, and any other topic related to Manchester United and the world of football. Manchester United has had the distinct honor of having the best coach/manager the world has ever known. No other manager has dominated his or her sport for as long as Sir Alex. Few managers have enjoyed being employed at one club for 25 years. He joins American coaches Paterno and Beamer, and legendary Auxerre coach Guy Roux. None of those individuals can claim to be as successful as Sir Alex Ferguson who has managed a staggering 19 major titles. He has no plans to hang it up just yet and with another batch of youth coming through the ranks why should he? It is only right that the first topic in over two years of this blog should be about Sir Alex Ferguson and his history at Manchester United. Sports fans in the United States are not as familiar with Sir Alex Ferguson as they should be but many are familiar with the club he built, a clear statement of a man who rarely seeks personal praise. You can talk to dozen of American sports fans who have heard of Manchester United but when quizzed about the coach of the club they come up short. They reply, “I know Rooney and Beckham but don’t they play in L.A. now?” A shame, but you can’t blame them. Ferguson hates the limelight and attempts to shift any credit to his players or the fans. Do not be fooled, he is the mastermind behind all of United’s success. It is surprising his accolades are not focused on. Fox and ESPN decided Blackburn v. Chelsea and Newcastle v. Everton was better match ups then Manchester United v. Sunderland on Ferguson’s 25th anniversary at the club. They should have told his story and the incredible honor bestowed to Sit Alex Ferguson. Sir Alex was born in Glasglow, Scotland and grew up to become a successful striker. His managerial career began in Scotland where he came to prominence with Aberdeen Football Club. There he overcame Rangers and Celtic to win the Scottish League in 1980 and the UEFA Cup Winners Cup in 1982. He joined Manchester United on November 6th, 1986. He brought back a winning mentality to United and rebuilt the squad, which of course paid off beginning in 1992-93 when United reclaimed their championship status. Ferguson’s greatest achievement must be when he knocked Liverpool off their perch with United’s 19th league title. Ferguson’s best attribute is his ability to understand when it is time for a player, no matter who he is, to move on and when it is time to rebuild. He has built 5 teams during his 25 years and each has been successful. He has done it with a perfect blending of creative talent, squad players, and youth brought up through the United’s youth academy. He has lead efforts to rebuild United’s training facilities, youth academy, stadium, and global appeal. His coaching staff has gone on to manage some of the biggest sides in the world and he is the status quo for judging any managerial success at a club, he is the standard barrier. It is fitting that the club he built is honoring him by naming the North stands the “Sir Alex Ferguson Stand” and building a statue at Old Trafford. United fans cannot wait to see what Sir Alex has in store; I say this because this is his team and we are all onlookers to the mastermind. It has always been his call and he bears any and all criticism for his decisions. He will lash out every now and then at the press and his players but he is always the first to give credit to his squad and the backroom staff. Enough credit cannot be given to the benevolent dictator who graces the home stands at Old Trafford but to avoid rambling, the world will continue to watch on as the master craftsmen builds yet another United team. The goal of this publication is to discuss Manchester United and the world of football from an American perspective. The publication is focused but not exclusive to Manchester United, the EPL, and U.S. soccer. Proof is in the puddin! Proof that Promotion/Relegation is far better than a Playoff system!!!! Before I go into my thoughts about this hugely important game between Chelsea and United tomorrow, I wanted to begin by making a case that promotion relegation is always the best way to run a league. The system that nearly all soccer leagues in the world use is this style The name, promotion /relegation, implies exactly what it means where teams at the end of the league will move down to the a lower league and league the lower league teams at the top of the table will move up to higher leagues. This is highly adaptable system and always makes for more entertainment over a longer course, ensuring higher ticket sales for nearly all the teams involved. While the playoff system and time can be highly entertaining it creates a system in which the best team might not get rewarded at the end of what should be considered a good season. The playoffs are in many ways like the multiple tournaments that occur in Europe at continental and national level. These tournaments, on top of the hotly contested national league titles, are hugely entertaining and pack among the most money per/game in the world of club soccer. This plays huge dividends for the clubs, yes, but also those fans that get nail biting exciting action from August to May. Some who are unfamiliar might suggest that this would only be interesting if things where still close in the league but what if you’re a mid-table of bottom tier squad? I answer what’s more exciting the uncertainty if your team will stay up which is real worry for at least 7-10 comes February, 6-8 come April, and 5-7 come May. If your team is a mid-table side then you have the uphill battle, all year long of trying to qualify for those continental tournaments, and have nearly all year to play in the national tournaments and attempt a run. There could be no doubt that playoffs make a month of the year exciting promotion/relegation especially when in combination with tournament soccer is exciting all year round. A prime U.S.A. example is College Football and the bowl system, which rewards only the best of the best with “real” bowls and even semi-successful teams. A season long year of excitement is what all American sports, with that one exception, seems to be missing. Imagine the increase in year round ticket sales and excitement for a shortened, relegation, promotion baseball league? Or a basketball league that makes every game a must win? I do concede that football would be nearly impossible due the size of the league, and the physicality of the sport, yet college footballs bowl system leaves the entire season exciting. Soccer, hockey, baseball, basketball, and what ever other sport I may have forgotten would be hugely entertaining year round if done this way. Come on think it over and tell me I’m wrong. Lets move on to a must win match in my opinion tomorrow morning at 10,(which can be seen on FSC), Man United vs. Chelsea. Manchester United walked away with a point earlier this season at Stamford Bridge and cannot allow Chelsea to gather too much drive or points this season. If anything United have to win to keep Chelsea from winning. While strange and rather obvious sounding, it is vitally true this time around. Here is why: If United win both of the two games that they have in hand they would still be within two points of Liverpool and if the Red Devils lose to Chelsea they would be within one of Chelsea. So mathematically but the big reason is momentum. Chelsea seems only to need a push to get going on a huge tear and threaten to take everything. Drogba might start tomorrow and if he gains confidence against a team like United there might not be any stopping to him. The even bigger reason is the same could be said exactly about United. If Berbatov or Ronaldo can have a big game and United can rebound from a shocking display against Derby it might be the medicine the guys need to be the scary team they were at then end of last season. I will not contend to have any real idea to who wins but I do believe United have a real shot to get the result. United did not play a 100% team for the full game against Derby for starters which is no excuse for a shocking display it does explain it off a bit and gives Fergie a rallying point this week in practice. He will also have the Rafa rant, calling Fergie scared and covertly United scared. 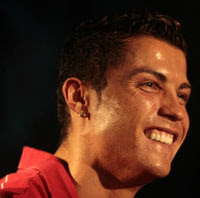 Ronaldo has the comments from Bosingwa and Rooney wants to back up his feelings of a positive result. I think United feel they have a lot to prove and will come fired up for the game and out for blood and will pull of the result. I think 2-1 or 3-1 sounds right but that is me being optimistic. Who knows what the hell will go down and what events will conspire tomorrow but that’s what makes sports so damn interesting! I am just glad that I am this excited in the middle of my chosen sports season and not at the end. To my known chosen sports but those I admire and only wish to see improve, GO G-MEN!!!!! Also WATCH 24, it rocks my socks off!!!! Hard to Say What to Expect? If I have any readers, I want to first start by saying sorry for the absence. I am a senior in college and have been too busy to spend too much writing down my thoughts so far. With that said I have seen and watched every United game this season and I have a lot to say to right now. So lets get to it. United saw an injury riddled start to the season. Hargreaves is still out and Soccernet.com is reporting a decision will be made about surgery in the coming weeks. Scholes is still out from a knee injury and will be sidelined for sometime to come and could see a return during the hectic start of the New Year. Good news is Ronaldo has returned is showing signs of his best form during patches of the game. He will not return to the Ronaldo of last year for another month or so due to his recent return to the team. Carrick just returned from a broken foot bone and is getting back into form. Rooney’s poor early start quickly began to change as he showed real class in 7 straight games scoring 9 for club and country. He is now sitting on 99 goals for United and seems desperate to hit the century mark. Ronaldo is getting warm receptions at Old Trafford but was not doing much celebrating after scoring goals. This changed in recent games and he is signaled he expects to stay at United this season and next. Fergie is adamant at attempting to get him to stay for much longer and supposedly is considering offering Ronaldo a $300,000 a week contract. A huge offer but Madrid will still come knocking and by the looks of recent results, they need some help. United are sitting on top of their group in Champions league play but tied with Villarreal at 8 points. United and Villarreal look good to go through to the knockout round with United playing Villarreal in Spain and Aalborg at Old Trafford. United now sit third with a game in hand at 21 points. Ahead of them are Chelsea and Liverpool tied at 26 points but Chelsea, who is the best defensive team in the EPL, has a better goal differential. United lost to Liverpool and got a draw at Stamford Bridge against Chelsea, two results I can only hope do not come back to haunt us. United will finish there first 4 games against the top 4 teams away from home in the EPL this season this weekend, when United travel south to London to play Arsenal at the Emirates Stadium. This could be a momentum changer for United as they struggled last weekend to secure a 4-1 lead, escaping with a 4-3 win over Hull, and saving a point against Celtic after having numerous chances to take all three points. Arsenal can say the same after dropping points to Tottenham in a thrilling 4-4 game, losing to Stock away from home at the Britannia Stadium, and drawing with Fenerbahce in Turkey today. Both teams are not in top form, but I really like our chances going to London. They will be up for the game, we always raise our form against Arsenal, and Ronaldo looks ready to gain some Old Trafford hearts back with a top performance. Fergie has a way of getting everyone focused on the game and finds ways to get more form from a side riddled with talent. If United can play a good game and grab the result our season could finally truly take off. Arsenal will be gunning for a scalp and I hope our counter attack will be working with the speedy Ronaldo, Rooney, and Berba playing target man. Anderson played well last year and controlled the midfield for large portions of the game and I will be looking at him to see how we are doing. With Adebayor out and the team looking stretched United will look to hold strong and quickly get the ball up to the dynamic three at the top of the formation. Big game this weekend that in the U.S. Setanta if you have DIRECTV and also online from setentausa.com. Myp2p.eu is a great place to download programs to watch live out of market games. I will have the recap of this important game and hopefully my notes do not end up wrinkled like they did against Chelsea. We Will Never Die! United had to deal with early pressure from Portsmouth but handled it well and only gave up one good chance. But United began to movie the ball really well under pressure, with quick passing and good movement off the ball, which kept Portsmouth off pace. Portsmouth continued to create half-chances and did pressure united closer to the 30 minute mark. United had a difficult time getting out of pressure and Portsmouth looked capable of scoring throughout. Anderson plays a great ball on the ground in-between the center and right back for Portsmouth to an onrushing Patrice Evra. He plays a strong ball low across the six yard box. Darren Fletcher gets to it and puts it past David James and just over the line. It might have come off the a sliding Sylvan Distin who had good position on Fletcher but Fletcher was able to force the ball over Distin and in. Good movement and finally Evra break through. Rooney broke out today and played some fantastic football. After a great piece of movement and passing on the right, the ball was played into Wayne Rooney’s feet. He took a marvelous touch around an incoming defender and blasted his shot just wide of the left post. The keeper had no chance if the ball was half a foot on the other side of the post. United ended the half looking determined to get a result. No changes at the half and United look to hold on to another quality goal off a good run into a good position by Darren Fletcher. During the early parts of the half Wayne Rooney should have had a goal that was disallowed by the linesman for offsides. He played his run perfectly and slots it under the on rushing David James. Credit to Rooney for not arguing and just playing his game. 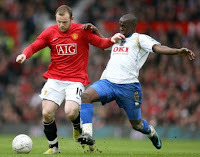 Sol Campbell chopped down Rooney in the penalty box but no penalty was rewarded in the middle of the second half. And in the defense of the referee the ball was blocked before the ball got close to Rooney. Rodrigo Possebon came on in the 74th minute for Anderson who had a good first game back for United. Anderson well take the next couple of days to recover and get ready for the SuperCup later this week. An international break means more travel for Anderson but he seems capable of coming up big when United need him. United gained control over the game and for the most part kept Portsmouth quiet. The game ended with Portsmouth trying to break down the United defense but United held strong and United go on to win 1-0. Fletcher is United savior again with another good performance. United closed space a lot better than they did against Newcastle, hopefully this form is the form we grow accustomed to this year. Tevez, Scholes, Rooney, and Anderson all played well going forward as Vidic and Ferdinand continued to perform at the top level. EVS came up with some good saves but was never really tested. Brown and Evra made good runs going forward and after the goal they dropped back and defended well. Possebon should be happy with playing a small but effective role and showed why Fergie has faith in him. United looked much better after a week of training and important mainstream players returning to the fold. United are lacking a true wide men right now more than anything. Good services where not on the offering for a large majority of the game but good overlapping runs by Brown and Evra helped and ultimately brought the winning goal. United also lacked aerial ability, as usually, in the middle once the ball came in, but this is not new. United did, smartly, play most of there crosses low where Tevez and Rooney are more effective. All in all United should be happy with the three points but cover is needed as United still have few options if an injury to arise on international duty, at the SuperCup, or in training. Fergie can concentrate on bringing in that elusive striker in the coming days before United take on Zenit St. Petersburg for the SuperCup. Why Berba to United is not the best move! I have 5 points on why buying Berbatov will not help us with our current situation and in the long run its better to stick with what we have. 1. The bottom line is we have some possible great young stars. Frazier Campbell has looked good when given chances and almost got on the score sheet against Newcastle twice. Manucho is a quality player and is exactly the kind of player we are looking for, someone who can play in certain games to help stretch the field and be a target man who can hold up the ball for the on rushing midfield. If we buy Berbatov or any new striker the possibility of these two getting a game are minimal. They will be relegated to the off chance an injury occurs and early FA and Carling cup action. Development has been severely lacking in United’s youth system, seems ridiculous to spend that type of money when options still exist. 2. While some may consider it a long shot, Louis Saha is another tailored made striker for what is needed at United. The best part is he still a Red Devil, while I know it may seem unlikely for Saha to make a full recovery and not pick up another injury, which he seems to have a knack for but striker can often surprise you when coming back from an injury. RVN after his knee surgery is a prime example. While I understand the worry of Saha being so prone to injury if we are to believe what we read than Saha’s new fitness plan might just lead him to an injury free campaign. 3. The cost of Berbatov is just too high. A 28-year-old striker should not cost $30+ million and it seems ridiculous to suggest he is. Ronaldinho was sold to AC Milan for less money. While United still remain in debt and the club is finding it harder and harder to make more than they spend, it seems like a large sum of money being spent for someone who might do harm than good. 4. Berbatov is not a guarantee success. People often watch how one player plays for one team and we often assume he will fit in to any team. This is not the case, look at Bent who was the leading English goal scorer when he played at Charlton but now finds it difficult to retain that form at Tottenham. He might come in and not fit in at all and while I agree with the ideas of his ability being the striker needs, I don’t believe he is worth the price tag set and do believe we have adequate cover in the form of youth and possibly from a veteran. 5. My final reason is simple; we can wait a year. United will find it difficult to win this season, period, with or without Berba. There is no guarantee that he will mean wins for United against other top 3 clubs. Chelsea look stronger than ever, Liverpool look to be able to dominate, and Arsenal have that swagger even when coming up short. United have the ability on there books now to get a win on any one of these teams and there fore we should avoid a huge money transfer that is simple not needed. Better options look available next summer in Karim Benzema, Huntelaar, maybe Berbatov again, David Villa, and the list goes on. What ever the case of the transfer market United look to have a strong enough squad to repeat as EPL champions. We saw how Chelsea can be pushed against the ropes and given a more quality side for Wigan they would have got at least a point last weekend. Liverpool can also count them lucky, except Stevie G came up big for the reds. Arsenal got beat by lowly Fulham who would have thought that would have been an easy three points. United can win this league but a good result is needed tomorrow against Portsmouth. Setanta.com will show the game and if you have a pc, myp2p.eu has good links. In any way if he does come to United he will help us win, but another generation of possible United stars will be lost to other clubs. I am interested to see what Fergie has planned during the last days of the transfer window. Manchester United play Portsmouth tomorrow at Fratton Park in Portsmouth. 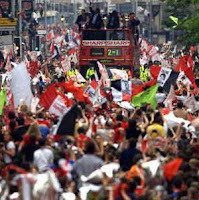 The game could already play a crucial role in deciding if United will be champions of England again. I know its only the second game of the season but with the schedule set as it is, it could very well play a huge part in United’s season. Let me explain. After Portsmouth we travel to Play Zenit St. Petersburg, the Russian club who has a star named Andrei Arshavin. Arshavin and Zenit won the UEFA cup and United will take them in the European Super Cup. Than September hits us with a bang. As soon as we return we take on Liverpool, at Anfield. A game where a draw or win has to be the result. Then the following weekend we take on Chelsea at Stamford Bridge. Things calm down after that but if we lost against Portsmouth, again at Liverpool, and again at Chelsea, we could be 10 points behind by the end of September. I said in another post the beginning of the season is the most crucial this year and United could be out of the hunt by the end of September. United must get a result against Portsmouth and hope a key striker can be brought in by the time we have to travel to Liverpool and than London. The injuries are hurting United with the biggest name Ronaldo out till October (missing two huge games). Hargreaves, Saha, Giggs, Carrick, Neville, and other are still out injured as well. Hopefully Giggs and Carrick will return in a short period of time and surely will return before September. Hargreaves also looks certain to return by the Liverpool game. Our midfield really struggled against Newcastle with the tremendous loss of true first level football, but with Anderson returning and others getting fit, United should return to the form they enjoyed last year. The transfer window closes in 7 days and the door is closing on signing Berbatov from Tottenham. It will be a huge loss for United not to bring in a striker and possible two other signing in respective positions. I believe if Saha can stay fit we will be fine, but that’s a big ask considering his injury riddled past. Right back is also worrying as the jury is still out on Brown, Neville can’t return to the high form he previously enjoyed, and Simpson has been loaned out, again. Another left back is also needed with more experience but the new Brazilian twin Da Silva looked good when he came on in the second half against Newcastle. Manchester United at the MLS All Star game in Houston, TX in a preseason warmup game in 2010.